The Evaluation Committee considering the self-evaluation of the National Research Institutes for Cultural Properties in Tokyo and Nara was held on May 19, 2008. On this occasion, we presented to the Committee reports on all the projects that were executed during the fiscal year 2007 as member institutes in the Independent Administrative Institution, the National Institutes for Cultural Heritage. The status of all the projects was explained in terms of their implementation and/or results, and the Committee members were asked for their opinions. At a later date, we compiled our self-evaluation, taking into account the evaluations and opinions of the Committee members. The following is the outline of the completed self-evaluation regarding the projects executed by the National Research Institute for Cultural Properties, Tokyo. The projects drawn up by the National Research Institute for Cultural Properties, Tokyo during the fiscal year 2007 with the aim of fulfilling its mid-term plan encompassed a wide range of activities, including surveys and research, international cooperation, publicizing and transmitting of information about the results of the surveys and research, and rendering of cooperation and advice to such bodies as the national government and local public bodies. The activity most highly evaluated by the Committee was our cooperation with the projects related to the conservation of the wall paintings of Takamatsuzuka and Kitora Tumuli. Both Institutes, Tokyo and Nara, were praised for achieving results in this difficult task beyond those planned for, in the midst of the great interest and scrutiny from the whole nation. Regarding the projects for international cooperation, it was noted that a maturing cooperative relationship was being developed with China and South Korea, and that further assistance had been rendered to such countries as Cambodia and Afghanistan under difficult conditions. In addition, our contribution to human resources development through the improvement of the knowledge and skills of people associated with various cultural properties, an endeavor achieved by hosting training and providing positive advice, was highly evaluated. However, it cannot be said that our efforts have been adequately conveyed to the general public and an improvement in our ability to publicize information is expected. As a result of the self-evaluation, we concluded that all the projects for the fiscal year 2007 had proceeded well and that sufficient results had been achieved. The results of this self-evaluation will be reflected in future project planning and the improvement of the administration of the Institute. 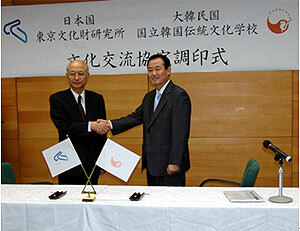 On May 13, 2008, an agreement on cultural exchange was concluded between the National Research Institute for Cultural Properties, Tokyo and the Korean National University of Cultural Heritage. The agreement pertains to the promotion of comprehensive exchange, and its aim is for the Institute and the University to contribute toward promoting protection of cultural heritage by through cultural exchanges in the fields of academic research and education. The signing ceremony was held at the Institute with the attendance of 4 representatives of the Korean National University of Cultural Heritage, including President Rhie Jong Chul. 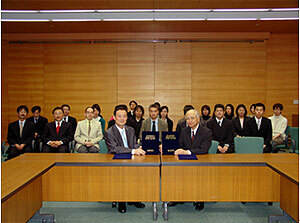 In the presence of many staff members of the Institute, President Rhie and Director General Suzuki Norio signed the cultural exchange agreement. The Korean National University of Cultural Heritage was established under the Blue House for the purpose of protecting and transmitting traditional cultures, and consists of 6 departments including Cultural Properties Management, Traditional Landscape Architecture, Traditional Architecture, Traditional Art and Crafts, Archaeology, and Conservation Science. Comprehensive exchange in a wide range of fields can be expected in the future. The Department of Research Programming is preparing for an international symposium entitled “Capturing the Original – Archives for Cultural Properties” that is to be held in December of this year. On May 9, a seminar was held to which Professor Kato Tetsuhiro of Kwansei Gakuin University was invited. Yamanashi Emiko of the Institute made a presentation entitled “The Art Research Institute and Sir Robert Witt Library” on the establishment of the Institute and the environment of art history materials in Western European societies during the 1920’s, and Professor Kato made his presentation entitled “Being ‘The Original’ – Its Significance in Art Studies”　in which he spoke on the way the issue of “the original” has been dealt with in the field of Western aesthetics. These were followed by a discussion on the meaning of “the original”. Professor Kato pointed out that the longing for being “the original” existed only in and after the 19th century even in the West and that, even with such a background, Alois Riegl who was active as an art historian at the end of the 19th century did not necessarily find the value of cultural properties in their original figures, but also recognized their age-value, and that Erwin Panofsky distinguished cultural properties themselves (original) from their duplicates, noting that duplicates lacked authenticity (“aura”). This led to further discussions on such topics as the difference in quality between the record and memory of “the original” and matters that should be conveyed in preserving “the original”. We wish to make the symposium a well-developed one by considering the theme from various angles and holding enlightening discussions. We also wish to make the symposium an opportunity to contemplate on our daily work which includes investigation and research on cultural properties, as well as accumulation and publication of materials. Mitsutani Kunishiro (1874?1936) is known as a western-style painter many of whose works were exhibited at the Bunten (exhibition by the then Ministry of Education) and the Teiten (exhibition by the Imperial Academy of Fine Artｓ)　in Meiji, Taisho and Showa periods. Sketches he left were donated in 1938 to the Art Research Institute, the predecessor of the Institute. Most of them were landscape sketches called “Doro sansui” (road landscape) in the Meiji period and drawings for his works created during the Taisho period and displayed at exhibitions. Among them, one portrait drawn in pencil stands out prominently. In this sketch, the technique of cross-hatching is used where thin lines are crossed to flesh out the motif, and the face staring at us with one eye half-closed is full of self-consciousness. Since this work was innovative not only among Mitsutani’s works but also in the history of western-style paintings in the Meiji period, it had not been introduced until now. However, Mr. Tsunoda Takuro of the Kanagawa Prefectural Museum of Cultural History and Mr. Hirose Naruhisa of the Okayama Prefectural Museum of Art, in the process of their researches on Goseda Horyu/Yoshimatsu Studio that left a major mark on the western-style paintings in early part of the Meiji period, pointed out the possibility that this work may be positioned in that stream. They made a presentation on this topic at the seminar of the Department of Research Programming held on May 7. The date written on the bottom left corner of the drawing ? February 21 of the 25th year of Meiji (1892) – corresponds to the short period of only one year when Mitsutani learned as a pupil of Goseda school. This drawing may be positioned as a link between Goseda Studio and Mitsutani, and also as a work that may cause a stir in the art history of the Meiji period. 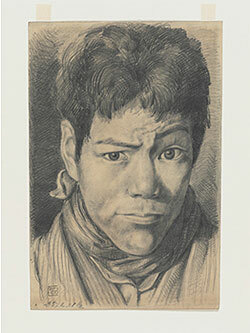 This work, along with sketchbooks filled with similar portrayals using cross-hatching, will be exhibited in “All about the Goseda Studio -A Bridge to Modern Paintings in Japan” (August 9 – 31 and September 6 – 28, 2008 at the Kanagawa Prefectural Museum of Cultural History, and October 7 – November 9, 2008 at the Okayama Prefectural Museum of Art). The National Research Institute for Cultural Properties, Tokyo has been cooperating in the conservation and restoration of Japanese art objects that are in the collections of museums overseas and conducting studies on the conservation and restoration of target works in collaboration with the museums that own these objects. In the fiscal year 2008, conservation and restoration will be carried out in Japan for four paintings: “Matsu ni Kujaku zu Byobu” (Peacocks and Pine Trees; a 6-paneled folding screen; Art Gallery of Greater Victoria, Canada), “Hoshi Mandala zu” (Star Mandala; hanging scroll; Vancouver Museum, Canada), “Mushi Uta-awase Emaki” (Poetry Contest of Insects; hand scroll; Museo Nazionale d’Arte Orientale, Italy), and “Yujo Tachisugata zu” (Courtesan, by Miyagawa Choshun; Museo d’Arte Orientale “Edoardo Chiossone,”　Italy), as well as for four craftworks: “Sumiyoshi Makie Bundai” (Writing table; Victoria and Albert Museum, England), “Kacho Monsho Makie Tate” (Leather shield; Ashmolean Museum, England), “Omi Hakkei Makie Kodana” (Pair of shelves for incense; Museum Velke Mezirici, Czech Republic), and “Rohkaku Sansui Makie-bako” (Cabinet with Mounting, European influenced shape; Museum fur Angewandte Wien, Austria; continued from the last fiscal year). Moreover, at the overseas restoration studio established in the Museum fur Ostasiatische Kunst in Cologne, Germany, conservation and restoration of “Kajuchoju Makie Raden Yobitsu” (Ornamental Coffer with flower and bird design, makie and raden technique) is in progress (3rd year of 3 consecutive years). In addition, from this fiscal year, at the restoration studio for paper in the Deutsches Technikmuseum Berlin, conservation and restoration of “Darumazu” (Bodhidharma; a painting in the collection of Museum fur Ostasiatische Kunst; to be continued for 2 years) will be carried out. In this overseas restoration studio, a workshop for overseas staff engaged in restoration is scheduled to be held in parallel with the actual restoration work. The “Training for Museum Curators in Charge of Conservation” has been held in July of each year for the staff in charge of conservation of materials working in cultural heritage conservation facilities throughout the country so that they may learn the necessary and basic knowledge and techniques. This training is reaching a turning point this year, marking its 25th anniversary (scheduled for 2 weeks from July 14 this year). Usually, we distribute the handbook on the seminar across the country by the beginning of February. Since applications far exceeding the fixed number (25 persons) were sent this year, we selected the participants. In performing this selection, priority was given to those who have some practical experiences in conservation facilities and who would hold core positions in conservation not only in their own museums but also in their regions for a long time after attending the seminar. Presently, we are preparing for the training by making the program, sending out requests for visiting lecturers, carefully examining the contents of the practical training, checking the equipments for the practical training, and so forth. The contents of the seminar are improved every year little by little by referring to the questionnaire returned from the participants. The participants have to be away from their work for as long as 2 weeks. As this may impose a heavy burden on both the participants and their museums, we are doing all we can in preparation for this seminar so that the participants can really feel that the seminar is truly meaningful in a practical manner. The Center for Conservation Science and Restoration Techniques displayed two pairs of 6-panel folding screens, three hanging scrolls and two Japanese lacquer works, which were fully restored in the fiscal year 2007 under the Cooperative Program for the Conservation of Japanese Art Objects Overseas. The exhibition was held in the Thematic Exhibition Gallery of Heiseikan of the Tokyo National Museum from May 13 (Tuesday) to 25 (Sunday). 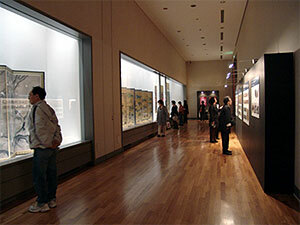 In addition, panels introducing the restoration process for the paintings and Japanese lacquer works were exhibited in the exhibition room so that the restoration work could be seen. All these art objects have been restored to conditions appropriate for display in facilities when they are returned to their respective museums. This exhibition became a very good opportunity for visitors to the museum to gain an understanding of the international contribution and cooperation made by the Institute. We will continue to advance the Cooperative Program for further contribution to and cooperation with international conservation projects. The “UNESCO Sub-Regional Workshop on Serial Nomination for Central Asian Petroglyph Sites” was held from May 26 to 31, 2008 at Bishkek, the capital of Kyrgyz Republic in Central Asia. Representatives of four countries in Central Asia except for Turkmenistan, namely, Kyrgyz, Kazakhstan, Uzbekistan and Tajikistan, as well as of UNESCO and ICOMOS participated in this workshop, and Yamauchi of the Institute attended as an observer. Although rock art (or rock painting) sites are found over a wide area not only in Central Asia but also in the entire Eurasian continent, the said workshop limits the area to Central Asia with the aim of collectively registering all the sites in that region as a World Heritage site. In this meeting, many case examples were introduced, and problems related to research, registration operations, management and conservation were discussed. Since this is a serial nomination of heritages beyond national borders, preparation of application forms for World Heritage site is likely to require more time due to differences in the progress of works in different countries. In the workshop, it was confirmed that similar workshops would continue to be held with the goal of World Heritage site registration in 2012. 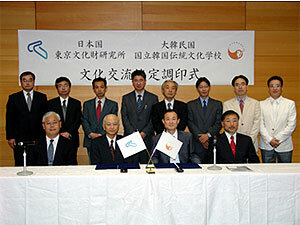 As a part of the Cooperative Projects for the Conservation of Cultural Heritage in West Asia, the Japan Center for International Cooperation in Conservation will participate in such workshops, keeping in mind future cooperative conservation projects, and endeavor to collect information while promoting cooperation with relevant parties and authorities in countries in Central Asia.